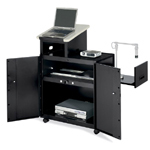 Holds one plasma or LCD screen up to 42". Steel construction, (14" deep inside) comes standard with 19" 10RU rack mount bracket in front and rear, and 6 port APC power module. 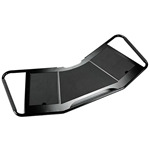 Includes universal screen mounting system and set-top camera mount (TT-1). 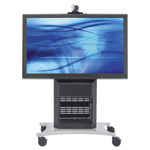 Supports two plasma or LCD screens up to 65". 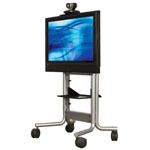 All steel construction, comes standard with 8RU 19" rack mount bracket, 6 port APC power module, superior M-Audio speaker set, and integrated adjustable camera shelf, and microphone wire access from front. 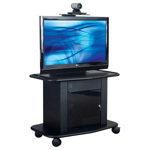 Supports one plasma or LCD screen up to 65". 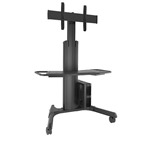 All steel construction, comes standard with 8RU 19" rack mount bracket, 6 port APC power module, superior M-Audio speaker set, integrated adjustable camera shelf, and microphone wire access from front. 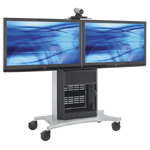 Supports one plasma or LCD screen up to 37" to 65", includes universal mounting bracket, one adjustable height shelf, wire management in rear, adjustable camera platform and 6 port APC power module. 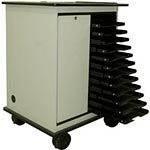 This sleek, modern fully-welded AV cart will add an element of style to any office or classroom. 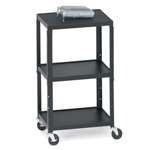 Non-skid pads and a security rail on top, and non-skid pads on the two fold-down side shelves help protect your equipment. 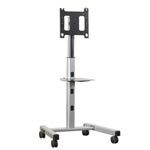 A height adjustable shelf designed specifically for the FUSION™ MPAU, MFAU, LPAU, LFAU and XPAU carts and stands. 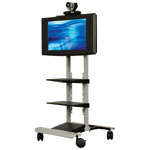 Mobile AV cart with adjustable height. 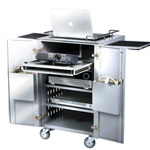 Constructed of hardwood ply and covered with an easy maintenance laminate surface, Mediatech's Laptop Cart is ideal for almost any laptop storage requirement.